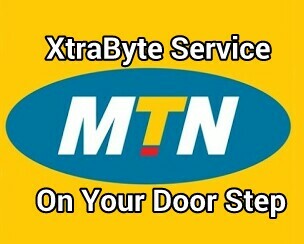 MTN XtraByte has been in existence before now, and most of you might know how to use the service. But for those of you who don't know about the MTN Xtrabyte service, and still yet to enjoy from it, here is your opportunity to know and enjoy from it. MTN XtraByte is a newly launched service that enables eligible active prepaid customers to borrow data or megabyte just on credit due to or the reason for running out of data when browsing and also allow customers to pay back on their next recharge of airtime. The service is just like when you are borrowing airtime from MTN and repay when next you recharge your phone number/line. The service will go a long way to do a lot of help to MTN customers, as subscribers can now borrow data as they used to do when borrowing airtime for making calls. This time around, once you are out data when browsing an interesting thing online, you need not to worry about the continuation of what you are doing at the moment. So once you are eligible for this extra data service, you just borrow data and continue you surfing online. Read also: How To Use Call Waiting, Call Holding And Call Divert On MTN Network. As the world of technology is growing sophisticated everyday by day, new innovations are been produced and put in place. People no longer desire having airtime on their lines but rather having data/megabyte in order to surf the net, stream videos, watch live matches online, watch on Dstv channels, chat on social medias like Facebook, whatsapp, Skype, BBM, Snapchat etc and do other things that requires browsing on the net with their smart phones or PC. To be frank with you guys, am one of those guys, so I prefer having data to airtime on my on my mtn line. What about you? MTN Network made the service orderly, as you can borrow airtime from their service called MTN XtraTime, and as well borrow megabyte from another service called XtraByte in the same platform. So if you an MTN customer, you have the opportunity to enjoy both from voice and data service. Remember, that's only if you are confirmed eligible. How Do I Become Eligible To Borrow From MTN Data Service? Your MTN SIM must be registered, Check the registration Status of You Sim Here.). Your line or number which you are trying to borrow the data with, must have been active on the network for at least 3 months. Your main account balance for your airtime must be between N0.00 and N12.00. How Do I Check If Am Eligible For Borrowing MTN Data? Y'ellow. You will be able to borrow data/airtime when you at least recharge 100 NGN monthly for 3 months. Thank you. That shows you are not eligible yet, so wait for the presumed month and make sure you recharge your line at least once in every month until the last month that will make it 3. For Those Customers Eligible For the XtraByte service, below are the Data Bundles Available For you. To Borrow data, just dial *606# and follow the prompt correctly. To check the balance of your borrowed data, dial *606#, and then select the number for checking Data balance. Once you do that, MTN will reply you with a message telling you the exact amount of data remaining on your line. That's all for borrowing data on MTN network. Stay tuned, as more of this on other network like Glo, Etisalat and Airtel will be updated. Got any contribution or question? kindly use the comment box to aid your view. Thank you.